Small, round dinner rolls in a pack of four. Safe for people with fructose malabsorption allergies (“Fructose Friendly™”). 4 * 80g rolls per package. Rice flour, potato starch, soy flour, tapioca starch, soy lecithin, canola oil, yeast, xanthan gum (415), guar gum (412), salt, water added. 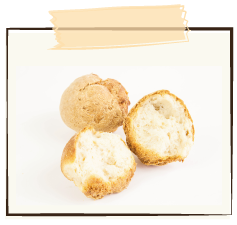 Store at or below 20º C.
For detailed instructions on how to get the best results defrosting, re-heating or otherwise handling a Silly Yaks gluten free Bread Loaf or Bread Roll product, please refer to our detailed Bread Loaves and Rolls Feature page.